Social dancing is a new experience for many people. And all of us can avoid awkward moments and create the most pleasant experience for ourselves and others by following good dance etiquette. This information can help you know what to expect and how to engage comfortably at our events. Asking others to dance and being asked to dance can be a stressful experience for many people and especially beginners. Please exercise respect, thoughtfulness and courtesy when asking and being asked to dance. 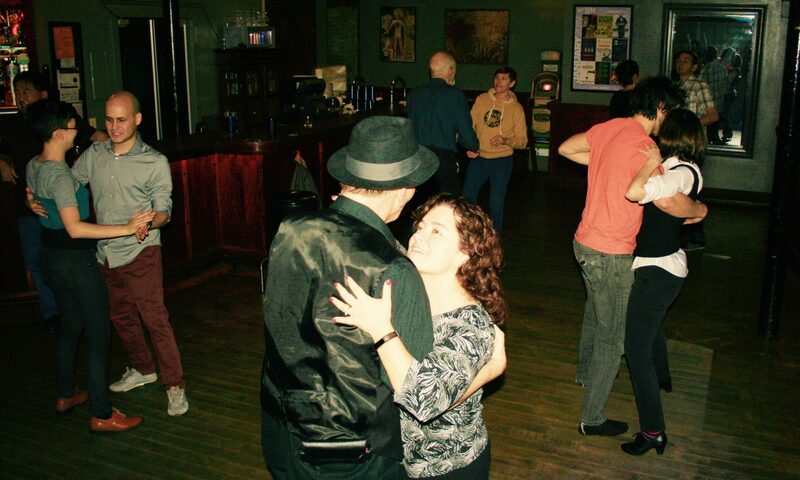 bluesCENTRAL promotes a friendly atmosphere and safe space for all dancers to enjoy learning and dancing blues. Ask others to dance even if you don’t know them or have little dance experience and no matter your preferred dance role. People who prefer to lead, and people who prefer to follow, regardless of gender, are both welcome to ask others to dance. You do not need to wait silently for someone to ask you. If you ask someone, and they accept, ask whether they would like to lead, follow or switch. Respect each other’s preferences. No thank you, my feet hurt. No thank you, I’m taking a break right now. No thank you, I am getting ready to leave. Not right now thank you, but please ask me later. No thank you, I would prefer a slower (or faster) song. Thank you but I was planning on dancing this one with someone else. Let’s do the next one. Thank you but I would prefer to solo dance to this song. If a dancer declines your invitation to dance, and does not include an invitation to dance later, don’t ask again that evening. They may decide to ask you to dance later that evening, in which case of course feel free to accept. Each dance invitation is your choice to give or not, and accept or decline. We encourage our dancers to be inclusive, and ask a broad range of people to dance. All combinations of ages, genders, and skill levels commonly dance with each other. The assumption is that you will dance for one song. If you want to dance the next song with the same person, ask them first. Asking someone to dance, and/or accepting someone else’s invitation to dance does not imply romantic interest, or any interest beyond being social dance partners for that one song. An especially thrilling, emotional, close, or intimate dance with someone does not mean that you should expect that person to dance with you again, or that person has romantic interest in you. Close physical contact such as close embrace connection, is an integral part of blues dancing, and like any other dance, it is just a dance, and does not imply anything beyond that. Social dances are a great place to develop and practice social confidence, and social skills that can increase one’s comfort in interaction with people, including with people you might be attracted to or intimidated by. We love how dancing has helped us and can help others grow in our social confidence and skills. Although some people meet a potential date or romantic partner in the context of a social dance, that’s not our purpose for gathering. Most of us are simply friends who enjoy the music and the dancing itself, with a variety of dance partners. There is body contact between partners in blues dancing. That is part of how the dance was traditionally done. In our dance culture here in Champaign-Urbana we encourage leads to use body language or words to invite the partner to close embrace or whatever embrace chosen to start the dance. The follow decides whether they choose to accept the invitation and step into the embrace indicated, leaving the amount of space they desire, or using words to indicate their preference. No pressure should be applied with hands, arms, words, etc to pull or force the follow into close embrace or any other position. Likewise, hands and arms should be relaxed enough throughout the entire dance so the lead and/or follow can easily move themself back to increase space at any time. Blues dancing does not involve any frontal pelvic connection. Blues posture is an “athletic” stance, with the chest slightly forward and pelvis slightly back. Dancers intentionally making such contact will be asked to leave. During social dancing, do not give feedback on technique or correct your partner’s dancing, unless they specifically ask you for feedback, or something feels uncomfortable or unsafe to you. During social dancing critiquing others’ dancing is rude, can hurt people’s feelings, and can discourage people from dancing altogether. This does not mean you must continue a dance that you don’t want to continue. You are always free to break off a dance at any time during the song, and say something like “let’s try this on another song” or simply “thank you” and leave the dance connection with that partner. During a lesson, let the teachers teach and give feedback. It’s ok to ask your partners during the lesson to try an adjustment that might help you as you are both learning. Do not try to assist with teaching unless asked by the instructor to do so. Hygiene is important because we dance close together. Keep your breath fresh with mints, gum, mouthwash, etc. Be careful about eating garlic, onions, or other odorous foods before a dance. Wear deodorant. Bring a towel or extra shirts if you sweat a lot. Use hand sanitizer and always wash your hands after visiting the restroom. Don’t wear a lot of cologne or perfume. Watch out for the safety and comfort of others on the dance floor. Do you best to avoid bumping others while dancing. If you accidentally bump someone, no matter who is at fault, apologize. A crowded dance floor is not the place for big moves, throwing arms/elbows, etc. If there is ever any inappropriate conduct, whether sexual, violent, harassing, unwanted pressure, or otherwise, contact the host of the evening as soon as possible so that the situation can be dealt with immediately. We encourage you to speak up about anything that makes you uncomfortable. The leaders of bluesCENTRAL will confront anyone who we become aware is intentionally and/or significantly violating our etiquette and safety guidelines. In those cases we will make a clear request for change in conduct. If that is not effective, or anytime we deem necessary for the safety of the group, we may ask someone to leave the dance. We want you to have fun, and for your dance partners to have fun and enjoy dancing with you at this dance, and at future dances. Following the above will help. Thanks!